E-Discovery is the identification, collection, preservation, processing, review, reporting and disclosure of electronic data in regulatory, civil and criminal environments. As well as the policies, procedures and legal compliance to support the process and validate the facts. As part of our E-Discovery service, we assist clients in conducting electronic discovery projects more effectively by providing a platform for the secure and confidential exchange of information during judicial matters. The function of Cyanre is to process data which is received in accordance with instruction and to present such findings in an efficient and effective platform for legal review. Identification of Relevant Data Sources: Refers to the process of identifying the location of all data which a company has a duty to preserve and/or pertains to the legal matter. Collection & Preservation: The acquisition of electronic information that is identified as potentially relevant. The preservation of the data in a forensic or non-forensic manner in such a way that a complete audit log exists and the integrity of data collected is intact. Processing: Must accommodate a wide variety of unstructured data, handle each form in a manner appropriate to its file type, and generate output that is structured in accordance with review requirements. Review & Analysis: At its most basic level the document review is used to sort out documents the company will actually provide and privileged documents that will be withheld. During this process, important knowledge for a case can be discerned from the large body of collected documents and email messages. Reporting & Disclosure: Reporting focuses on how the data was collected and reviewed and ultimately how it is produced in civil litigation and regulatory investigations. Managed and secure handover of data to the opposing party, tribunal or court proceeding. The Objective of e-discovery is to obtain information, which is information that is stored electronically and includes e-mail, instant messages, word processing files, spread sheets and other electronic content that may be stored on desktops, laptops, file servers, mainframes, smartphones, employees’ home computers or on a variety of other platforms, which will be useful in developing relevant information for pre-trial motions and for the trial itself. E-discovery is becoming much more important in the context of civil litigation. E-discovery today represents a substantial portion of the litigation process, and companies that fail to produce electronic data in a timely or appropriate manner face the risk of paying millions of rand in sanctions and fines, not to mention loss of corporate reputation, lost of revenue and embarrassment. Nearly 90% of all information is created electronically. Millions of transactions of legal relevance are being conducted electronically, while only 30% of all information makes it to paper. In 2008, 30 Billion e-mails were sent daily. 60-70% of companies cannot validate the accuracy of their internal data. Although there are many companies in SA who can assist a client to identify and collect all relevant data, at the end of the day it is up to the client or legal team to sift through hundreds of thousands of pages of relevant data. This team takes the responsibility and onus to ensure that all data is reviewed and that a clear and accurate report is generated, that no legally privileged data is disclosed and that the exposure of the client is adequately managed. Faced with this challenge, Cyanre has, after careful evaluation, selected a number of international software platforms which, in combination, can assist your team in this regard on a cost effective manner in a price range which is acceptable in South Africa. Cyanre can host all your data which must be reviewed on our reviewing platform or deploy our platform in your organisation. This allows your team to easily review documents, categorise them and scare the information. Your team can now review data from any location in the world on a centralized database and in real time see comments from other team members, exclude previously reviewed documents or identify documents which has not been reviewed yet. A complete audit trail exists of the whole project and reports can be generated within minutes. Once your project is complete, relevant documents, legally privileged documents and non-relevant documents could be separated within minutes. If data must be produced to opposing parties or 3rd parties, this data can be hosted on the same platform, within minutes, in a secure and controlled environment. Cyanre can scan and OCR all hardcopy documents to enable the client to conduct electronic searches against the data. Cyanre can assist the client to identify and collect all data or can receive the data from the client, the client’s legal team or forensic team. Cyanre can extract all relevant data, based on a keyword analysis, timeline analysis or communication analysis (this data can also be received from the client). All data is de-duplicated to minimize the quantity of documents which must be reviewed. Cyanre has in-house review teams which can assist your team with preliminary reviewing to reduce costs and increase results. Improved services to clients by freeing attorneys and staff for higher-value activities. Improved control over e-discovery through snapshot reviews and automated audit trails. Reduced discovery and overall litigation costs. Reduced discovery risks by using Cyanre’s end-to-end services. No risk of loss of data. Efficient maximization of resources on a global basis – “Work from anyplace”. Managed and Secure handover of information. Outsourced Responsibility – no additional upscale of your network. Collaborate and share case analysis with your team (World Wide). 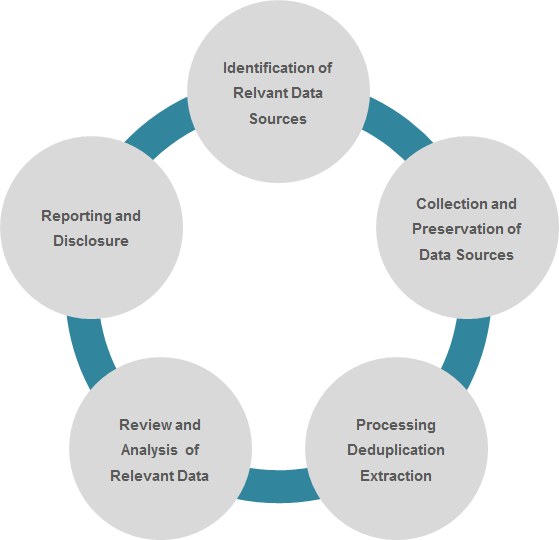 Intelligent data processing, including the elimination of duplication and the extraction of metadata. Client data kept separate and secure from legal firm’s network.